After DxO released the new version of Nik I received emails asking how to use the new Nik Collection with Affinity Photo. A lot of people say you could use the old free version of the Nik Collection but DxO has removed this capability. This is incorrect and I’m going to show how to use the Nik Collection with Affinity Photo. To learn more about the different aspects of using the Nik Collection, visit the Lenscraft Nik Collection Tutorials page. Although there are a few bugs you might encounter using the Nik Collection with Affinity Photo, I don’t believe these down to DxO. The Nik Collection appears much more stable compared to the previous versions which would frequently crash when I tried to use them. This is not everyone’s experience, so if you have the old version of the Nik Collection installed you might like to try them. The video explains how you can install and use the Nik Collection with Affinity Photo. It also explains some of the problems you might encounter as well as how to work around them. If you haven't done so already, why not subscribe to my YouTube channel. I publish a new, informative video every week. 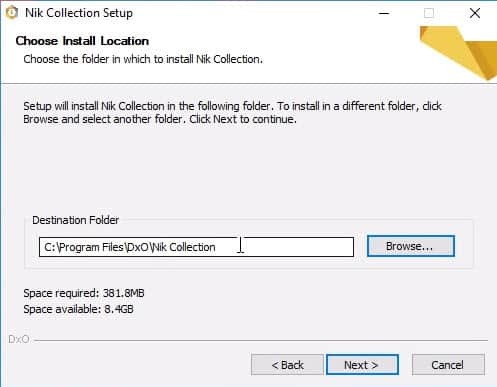 If you already have the Nik Collection installed to your computer, you can skip this step. You will though need to locate the Plugin files and make a note of their location. For example, “C:\Program Files\Common Files\Adobe\Plug-Ins\CC”. You will need this in step 2. If you haven’t already installed the Nik Collection Plugins, you should do that now. The implementation of the new DxO version of Nik is largely automated and easy. It will though remove any previous versions of the Nik Collection without warning. If you still want to keep the old version, be sure you have a copy of the original installation files before progressing. You will need reinstall the old version if you decide to switch back. During the installation you will be prompted to confirm where to install the software. You can change (if necessary) the default location and click the next button. This is the important screen as it controls where the Plugin files will be installed. It lists the compatible Host applications the installer recognises on your computer. Despite Affinity Photo not being recognised by the installer, you can select to install the Plugin files to the default Affinity Plugin folder. In the installer dialog, you will see a small + icon at the bottom left of the list. You can use this to add other locations to install the Nik Collection plugins to. If you’re not sure what your default Affinity Photo plugin folder is, you can find it using the Affinity Preferences described in Step 2 below. Once the installation is complete you will find a “DxO” folder has been created. Inside this you will find a separate folder for each of the Nik Collection applications and inside these are the plug-in files. Start by opening Affinity Photo and selecting “Edit | Preferences” from the menu. This will display the Affinity Photo Preferences dialog shown below. Select the Photoshop Plugins from the lower row of the icons to display the Plugin preferences dialog shown below. As we mentioned earlier, if you want to know the default location of the Affinity Plugin folder, you can use this dialog to find it. At the top left you will find a button marked “Open Default Folder in Explorer”. Click this and it opens Windows Explorer (or Finder on a Mac). 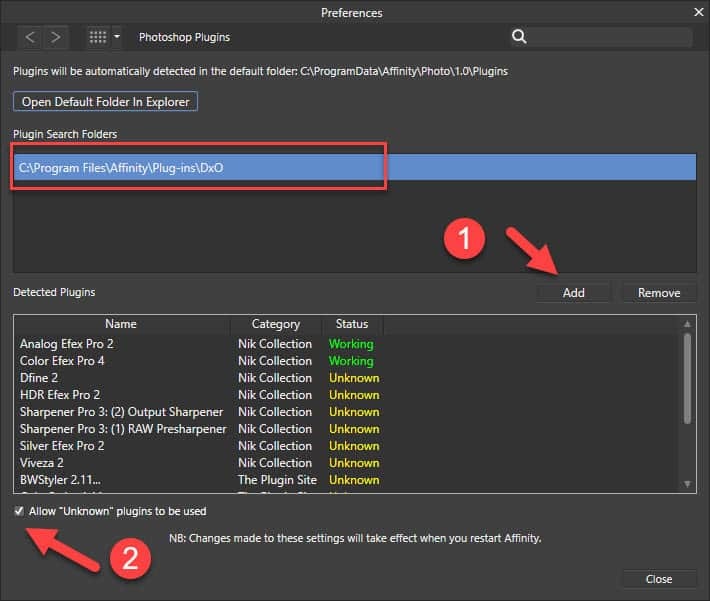 This is the best location to install the plugins to as Affinity will find and list them in the “Detected Plugins” list. 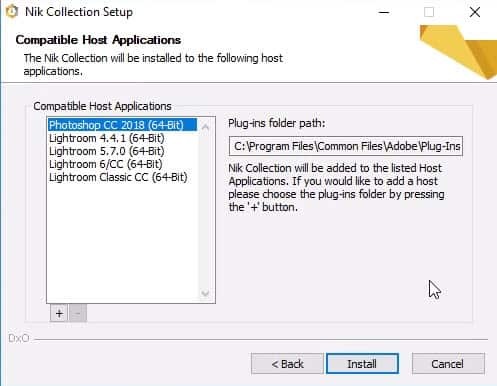 If your plugins are installed somewhere other than the default folder, you will need to a link to them. You do this by clicking the “Add” button marked 1 in the illustration. This opens a file explorer window which you can use to select the plugins location. Once you have done this you can click the Close button and Affinity Photo will prompt you that it needs to restart before your changes can take effect. 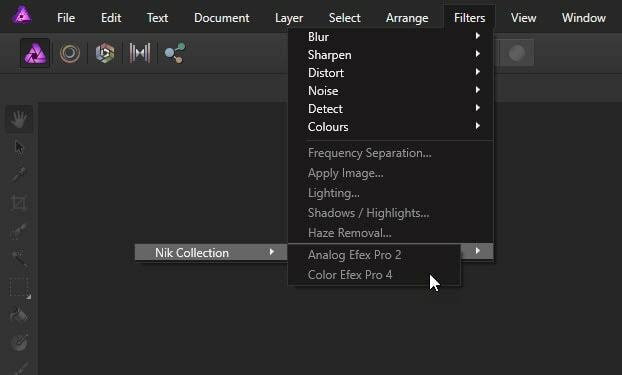 Once Affinity Photo has restarted you will be able to see the “Nik Collection” at the bottom of the “Filters” menu. Here you see the new Nik Collection folder but only two of the plugins are listed. 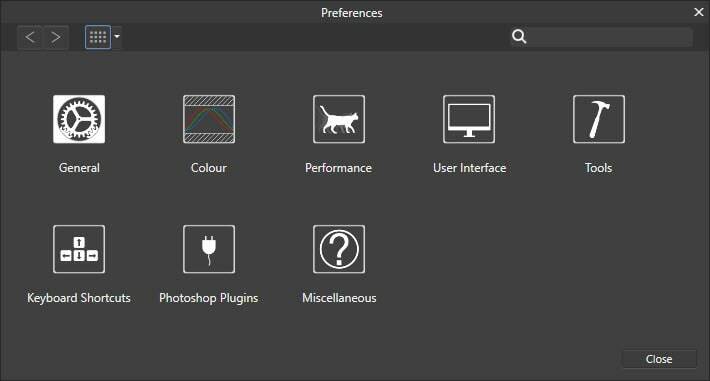 If you look back to the previous screenshot of the Preferences dialog you can see Affinity Photo only recognises two of the Nik Collection plugins. Look further down the Preferences dialog and you can see there’s an option numbered 2, to “Allow Unknown plugins to be used”. When you check this, Affinity Photo will display all the plugins in the Filters menu, even if it doesn’t recognise them. You can now launch and use the new Nik Collection 2018 by DxO from Affinity Photo. If you want to know more about using the Nik Collection, visit my Nik Tutorials page on Lenscraft. I don’t disagree that the colours in Viveza are wrong and that needs to be fixed but I think the problem lies with the Affinity colour handling and not the Nik Collection. If the Nik Collection was at fault, I would expect to see the issue when you use it from the Adobe products but you don’t. As for DxO charging, I don’t blame them at all. They have done work to migrate and tidy up the code. It now uses the correct code libraries so will have a longer life. They are also providing support for the new version. My view is that you wouldn’t buy a car from one garage and expect a completely different garage to fix it for free. I have been using NikColl since it became free with Google.When it was bought by DXO I decided to subscribe to this new edition on june 23 and was quite disappointed to be unable to install this new edition on my Affinity Photo (the “old” version was Ok though).I got in touch with the people at DXO – in french which is my native language- and their answer was that Aff Photo was not compatible with NikColl and they suggested a…refund !!! I was quite disappointed and couldn’t understand why the new plugin couldn’t work with my AP version (the latest).I started investigating the numerous tutos in english ( which have been quite helpful in many cases) and found your tuto on the 24th if I remember well.I followed your instructions and had no problem installing the DXO plugins. Not only did I solve my “problem” but this gave me the opportunity to learn a lot from your tutos. Thank you for solving my problem and giving me the pleasure of viewing some of the landscapes I particularly love. Cheers, Guy Poizat,Cabestany, France. Vous êtes les bienvenus Je suis heureux que cela vous a aidé.